I shan’t tell you again about how Lord Rama was exiled from the kingdom to the forest with his sweet Sita where he met his right-hand man Hanuman. And I won’t tell you how, after brutal battles with the demonic Ravana, the couple returned to rule, guided safely home by oil-filled lamps laid out by their loyal subjects. After all, the Diwali legend has been delivered time and time again, most brilliantly in that excellent epic, the Ramayana. What I will tell you is how to dine wisely and well during Diwali. 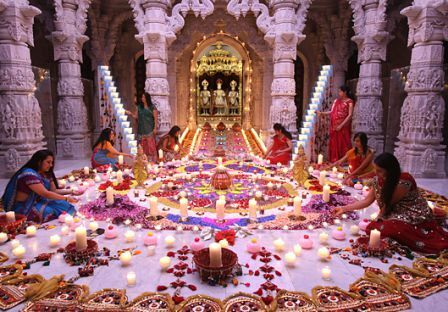 The Hindu celebration may be known as the Festival of Lights, but for a body, it indicates the time of year one can, will, and should only become heavier. Diwali’s trademark noise and brash brilliance is in complete contrast with the calm, subtle surrounds that surmise the Old Westminster Library’s signature style. But should you fancy some fine festive dining in an elegant environment, Vivek Singh’s 5-course modern Indian celebratory menu could well be just the thing. In no particular order, Diwali at Dishoom is about fun, family, friends and feastin’. The new Kings Cross branch means there’s now three venues where one can try two festive favourites: the veggie-friendly phaldari kofta ruby, and a chilli garlic crab I bet you can’t wait to get your claws on. Do make the most of the marvellous mixologists, too. There are few London locations more spectacular than La Porte, Indian or otherwise. Palm tree-littered, 40-foot waterfall-embellished, all-round fancy, the former Edwardian Ballroom feels extra decadent at Diwali. A special a la carte menu is planned; arriving early to get in the festive spirit with a fresh coconut cocktail or two in the Jungle Bar is strongly recommended. Co-owners Euan Sey and Kanthi Thamma have paired up with local artist Amber Stefani to lay on a sumptuous, scrumptious celebration at Curry Leaf Cafe. The bespoke menu is made up of chef Kanthi’s unusual, innovative dishes – expect traditional dishes served in surprising new ways; all guaranteed to make a bang as loud as any cracking patakas. Ensure you attend with an appetite, for Cinnamon Culture is presenting a bounteous banquet served buffet-style so you can truly get your fill of festive classics that are as authentic as they are innovative. Self-serve starters and mains let you march all over India as you pile your plate; a plated dessert trio is a fine finale. Music and candlelight enhance the atmosphere. Brighton will get a little brighter as Indian Summer hosts a charity Diwali supper for the Curry Tree Foundation. Featuring a festive feast of street snacks, a royal thali and a trio of mithai, rangoli decorations, and a killer quiz, all served up to the strains of the sitar, it’s an excellent event for a great cause. If you fancy a birrov a Bollywood bash in true London style, Deepak Yadav’s big night out at Mayfair’s Press Club might just be how you do Diwali. The evening is informed by the ‘beauty, colours, charm and buzz’ of classic celebrations, made modern by the latest, greatest song hits, dhol drummers, live acts, and Champagne guzzling galore. 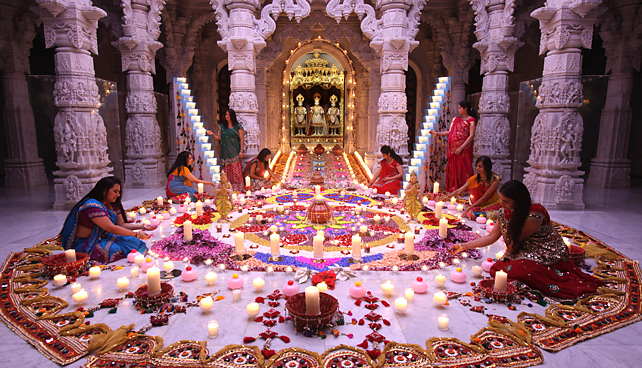 It’s always a treat to visit the spectacular temple in Neasden, but the atmosphere is most electric at Diwali. One can wonder at the icons throughout the day and perform puja from 6 p.m., regularly refreshing themselves with snacks from the street stalls out in force. The evening ends on a bright note with fireworks from 8.30 p.m. The beautiful Bhaktivedanta is set in extensive, expansive Hertfordshire countryside and is a place of pure tranquility. 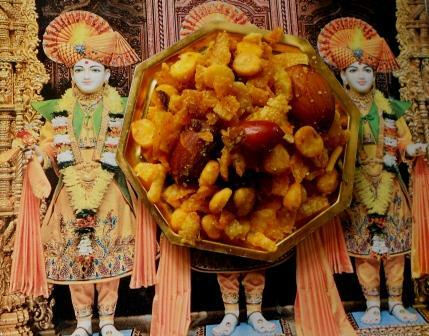 As well as a full cultural programme of dedicated Diwali events with a firework finale on Sunday, Friday’s Annakut is somewhat of a spectacle; the name referring to a mountain of sweetmeats that will be declared divine before distribution amongst earthy attendees. A natty little bowling club with an almost colonial feel is where those in the know head for their monthly munch on regional. authentic Indian food, all cooked by a chef with the most awesome andaaz I’ve encountered. It’s always splendid, but the supperclub menu for Diwali will be extra decadent… with a crafty surprise to boot. At Brixton Cornercopia the Papi’s Pickles girls will be serving South Indian festive feasts at breakfast and brunch; both accompanied by lashings of lassi lavished with rose. Expect the fluffy pooris and idlis with sides of sambar and kooti, crunchy appalams and pachadis, and cool, sweet, soothing pal payasam to put paid to the rest of your day. This evening features food, drinks, music, and even, should you so desire, yoga-based inversion therapy in a dedicated quiet room. The home-made ‘Heaven on Earth Feast’ menu involves mango dal, celebration rice, sag aloo, rotis, chutneys, and unlimited homemade chai, with guests welcome to add alcohol to the affair. A 19th-Century church is an unlikely location for Diwali dining, but that’s just what Rootless Garden has planned. It’s for a cause – meaning your money is not just for a 5-course feast, but also to make winter more welcoming for the capital’s elderly. The properly Punjabi menu kicks off with a cocktail and closes with chai; both bookending delights like pakoras, dal, chicken curry, and gulab jamun. How da flip can you keep greedy Diwali dinner guests sated whilst they wait for the main event? Howdah’s is how. The company’s selection of namkeens (Indian savoury snacks) is stridently-spiced and, despite leaving a tell-tale oiliness on foraging fingertips, are light and crisp. They’re also made from the right raw materials, to authentic regional recipes. With masala-ed and peppered banana chips, peanut pakoras, onion bhajias, Bombay puris and the diminutive spice-stuffed pastry pinwheels called ‘Bakarwadi’ in the colour-coded, foil-fresh bags, you’d best nab a few before you hand them out. They might not be Pringles, but like those snacks, once one pops, they most certainly can’t stop. I say it every year and more than once a year, but a festive feast would not be as fulsome without a few tins of Asif Walli’s gourmet spin on the Bombay mix Brits so know and love. If you don’t know Duke of Delhi by now, I might ask what on earth you’ve been eating instead; but I’d rather just tell you to go and buy now- from Fortnum & Mason, no less. Something sweeter? The grand old Duke of Delhi also mixes his mixture into spiced chocolate bars. The author at Culinary Adventures of the Cocoa Nut loved them, which is no real surprise, seeing as she’s me. Yes, I am fully aware that the majority of Hindus are vegetarian – but if meat is on your menu, then Pratap Chahal’s inventive, ambient pickles from his ‘Curious Curries’ collection are very worth relishing. Pass round with pappads, or heat’n’eat in small spoonfuls with vast amounts of fluffy white rice. For Diwali dining, the Pork Vindaloo version is perhaps most apt – Hindus call the cow holy, so best only say ‘acha’ to the Beef Achari incarnation on another occasion. This website is a solid source of South Indian recipes, with many in Tamil. On this dedicated Diwali page, you’ll find eye-candy thumbnails for 272 recipes from all over India, along with further festive foodie reading. As ever, Dassana offers a reliable, regional selection of her own festive recipes. For 2014, the 75 suggested recipes in her curated list are arranged under handy categories, but you’ll want to eat every one. Should you be afflicted with a sweet tooth, Jo Preet’s Diwali delicacies will surely please you, with over 50 of the 70+ recipes all about making mithai. It’s not traditional Diwali fare – but you should so make it a customary part of your customs henceforth. Love Turkish delight, aromatic Indian flavours, heady sugar rushes and the jewel-bright colours of the shimmery, shiny saris donned at Diwali? Feast your eyes and your sweet teeth on Sanjana’s beautiful Bombay halwa. 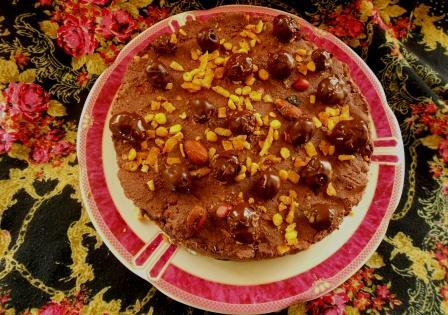 If mace-laced fudge sounds more like your cup of sugar, you will find her divine mohanthal moreish. And, if you associate semolina with school dinners, Sanjana’s spiced seeroh will convince you of its charms once and for all. Dina Thanki’s cards should always be in evidence for any occasion that requires you to put pen to paper and send well-wishes. Her fun Diwali designs are sure to raise great big grins from all who receive one; if indeed you can bear to send them away from your own home.